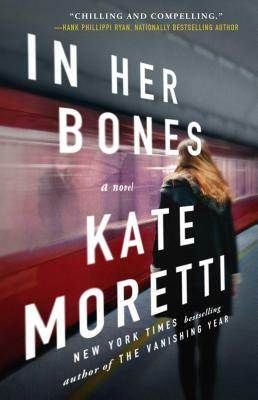 "A masterfully crafted, multilayered novel...Kate Moretti manages to cover all the angles, making the story deep and dynamic...In Her Bones is complex, honest and heartbreaking. It is much more than merely a mystery and is well worth reading." "Crime fiction adores girls in trouble. Moretti's latest nail-biter is no exception, but it is exceptional...Though Moretti's emotionally astute tale can be heart-rending, readers won't be able to look away. As slow, creeping dread sets in, so does the inevitability of the terrible situation the town finds itself in, offering a deliciously sinister glimpse into the duplicity of small-town lives and the ease with which people turn on each other when tragedy comes calling. Moretti's tale of jealousy and obsession is nothing less than dark magic. Witchery indeed." "This cautionary tale keeps the reader guessing to the end." "The tale’s suspenseful core should catch and hold most readers, especially Gone Girl fans." "A suspenseful mystery about small-town secrets and scandals." "Bestselling author Kate Moretti’s minute attention to the way people's brains shift, how the floodgates of all they've been ignoring or repressing can suddenly open, pushes her novel into something more discomfiting than a saga of small-town sins. An incisive portrait of midlife disappointment and suburban paranoia, wrapped up in a cleverly plotted mystery, The Blackbird Season is an absorbing thriller that lingers long after you put it down." "Kate Moretti’s insightful, starkly human mystery about a girl they call 'witch' has that sit-down, gotta-cry eloquence readers long for. Mean girl alliances and small town loyalties collapse in unison on the day the blackbirds fall. This story will hold you tight to its pages well past your bedtime. The Blackbird Season is Moretti’s best yet." "The Blackbird Season pulls off a very difficult thing: it's nail-biting and thought-provoking all at once. It's a rare that a book can make you turn pages like your life depends on it, but also give you food for thought because the characters are so perfectly drawn. A stunning achievement from an extremely talented writer." "Moretti begins The Blackbird Season with a sinister premise — a cloud of birds fall from the sky on the same day a teenage girl people call ‘the witch’ goes missing. A spellbinding tale of long-held secrets and small-town scandal, The Blackbird Season is one of those stories that sneaks up on you, each chapter building steadily to an ending that will haunt you long after you turn the last page." "The characters are authentically flawed and believable, and part of the mystery is the unfolding of their motivations…The Blackbird Season is about how people—teens and adults alike—get lost and disconnected. All that, plus a suspenseful mystery—what more can you ask for?" "When a troubled teenaged girl goes missing in The Blackbird Season, the town in which she lives is ripped apart by suspicion. As disturbing secrets bubble to the surface, no one is safe. Kate Moretti’s trademark vivid characterizations, surprising storyline, and heart-stopping suspense kept me eagerly turning pages long into the night." “The Blackbird Season is more than a haunting mystery; it’s an intense exploration of a family in crisis and a community rocked by scandal. How well can you truly know the ones you love? How far can you trust them? I couldn’t stop reading until I knew the whole and harrowing truth." "For readers who love small town dynamics where everyone knows everyone else’s business and nothing is what it seems, The Blackbird Season is the perfect novel to pick up this fall."